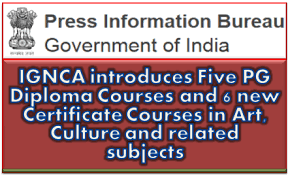 Country's premier Arts organization- Indira Gandhi National Centre for the Arts (IGNCA)- an autonomous institution under the Union Ministry of Culture, Government of India, has decided to introduce five diploma courses and 6 new Certificate Courses in art and culture and related subjects. Basic aim of these courses is to create arts and culture with all its dimension and information technology to design and develop content exploration system to intensify culture learning and visualisation. It employees modern digital tools, techniques, and methodologies to achieve the intended purposes. This initiative attempts to make our ancient knowledge and achievements accessible on a multimedia platform, thus enabling communication between the ancient and modern knowledge.